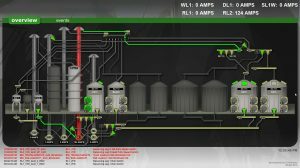 Many small to medium sized grain handling facilities, unlike most large facilities, do not incorporate any kind of PLC or automated control system to run and monitor the facility. Instead, they incorporate hardwired controls which may have been installed and modified by multiple contractors and/or plant personnel. This isn’t a bad thing by itself, but many of these facilities do not have up-to-date drawings of their systems, if they have drawings at all. Troubleshooting problems for these systems is extremely time-consuming. Say a conveyor or leg shuts down one day. What caused that to happen? Is it the plug switch? The overload? Could it be a downstream piece of equipment that someone else turned off? In many cases the interlocks for a piece of equipment are all hardwired in series. Any of them could have shut down the equipment, but which one? ug switch is tripped, for example, that piece of equipment may change color and trigger an alarm. If a conveyor or leg shuts down with this system installed, one only needs to look at the HMI to see exactly what caused it. Troubleshooting problems isn’t the only thing that gets easier when a facility incorporates an automated control system. In this series, we will talk about the advantages that automation brings to grain handling in process ease of use, as well as equipment protection and slowdown monitoring. How does the new employee know he is sending grain to the correct bin? In a grain facility without the HMI, he would be trained to start certain conveyors and legs and change certain gate positions. The names or numbers of these devices often are not in any order, nor do they make any particular sense. After performing this operation over several weeks or months, he eventually has these sequences memorized, and all is good until the next new employee arrives. Now consider the grain facility with the HMI. The entire facility can be seen on a screen. The new employee can see what equipment needs to be started and repositioned to move the grain from one point to another. All of these pieces change color to indicate they are running and what position they are in. Now that the new employee can see the path the grain is taking, the learning curve is drastically reduced. What once took weeks, now may only take days. Let’s take it one step further. Once again, the employee is sending grain to a designated bin. This time, however, instead of having to start each individual piece of equipment, the employee can just click on the bin to send the grain to it. Then the PLC takes over, starting each piece of equipment and moving the appropriate gates in sequential order. It even uses appropriate delays to reduce the power demand of starting the equipment. Once everything is running and aligned, the operator is allowed to open the pit gate and start flowing grain. 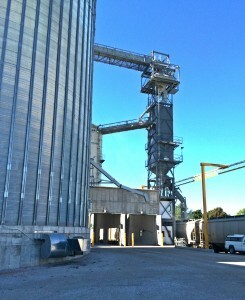 What happens if they are unloading corn and the selected bin is holding beans? The PLC can actually perform a commodity check between what is to be unloaded and what it has been told is in the bin. The operator can select the commodity they are unloading and if it doesn’t match the bin, the pit gate cannot be opened, preventing the mixing of grain. It doesn’t have to stop there. How about entering a list of trucks in the order they are coming into the pit along with the commodity they are bringing in. After a truck finishes unloading and the system has cleaned out, the operator selects the next truck from the list. If the commodity is different from the last truck, the system automatically changes the grain route to the preselected destination for that commodity. Without automation, an employee would need to know the contents of a truck, the contents of a bin, and the proper sequence of devices to trigger in order to get the contents of the truck into the bin. It is not hard to imagine the many points of failure of a manual system like this. With automation, however, all an employee needs to know is what truck is waiting to be unloaded. The PLC takes care of the rest, saving time and energy in the process, and limiting points of failure along the way. modify the controls without having to rewire them. So far we have discussed how to make it easier and more reliable for the operator, but what about protecting the equipment? In the next blog post, we will talk about using this system to monitor equipment for slowdowns and hazards.